Copyright © 1966 TIME, Inc. All Rights Reserved. Article used by permission. Reproduction of multiple copies of this article is strictly prohibited. Contact TIME, Inc. to request permission. At stations just above Oriskany's flight deck, crewmen turn to see a pink-white firelit cloud (left) ballooning out from the hangar deck three levels below. On the hangar deck itself, desperate sailors (right) wheel a 1,000-pound bomb on its dolly toward the side to jettison it. 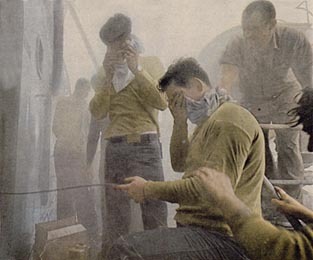 On smoke-laced flight deck (above), fire fighters get a high-pressure hose into position. Others (lower left) manhandle a jet out of danger. Below, crewmen keep a safety line on a sailor who is inside trying to rescue trapped shipmates. 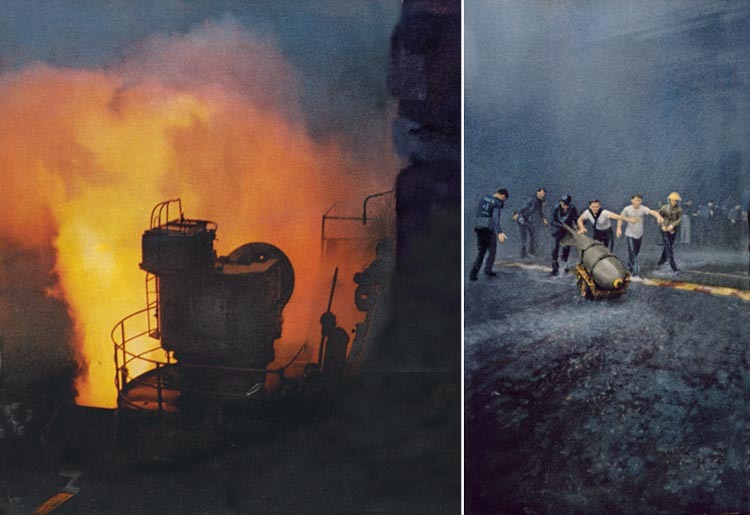 On station off North Vietnam in the Gulf of Tonkin, the 42,000-ton U.S. carrier Oriskany was in mortal danger from the second a magnesium flare somehow exploded on her hangar deck. The fire spread to other flares and then to combat-ready aircraft, and in its path lay rockets and bombs of all sizes. "If the bombs had gone off," said an officer afterward, "we would have lost the ship." Amid choking clouds of acrid white smoke, which swirled down through the forward third of the ship and suffocated those trapped there, brave crewmen reached the bombs and heaved them over the side. But in less than three hours, 44 officers and men died. And some of those who survived had harrowing tales to tell of endurance, luck and heroism.  LT Julian D. Hammond, Jr.
 LtJG James Anthony Kelly, Jr.
 BM3 Alvin M. Shifflett, Jr.
"Fire in Alpha 107 Mike!" Far down in the complex innards of Oriskany there is a compartment called Damage Control Central, and in this room is a panel covered with scores of small amber lights, each on of them connected to a heat sensor somewhere in the ship. At 21 minutes after 7 on this morningjust as the aircraft carrier is getting ready to launch her first strike of the daythe light blinks on beneath the label reading A107M. Simultaneoulsy a bell begins to ring. The sailor on duty immediately picks up the telephone, dials 222 and tells the bridge, "I have a fire alarm indication for Alpha 107 Mike." On the bridge the bosun's mate clangs Oriskany's shining, chrome-plated fire bell and his voice rings out in loudspeakers throughout the ship: "Fire, fire, fire in frame 42! This is no drill! This is no drill!" Aboard any aircraft carrier on extended operations fire alarms are commonplace and nothing for most people to panic about. But the Damage Control Officer worries about all of them. "Every time I hear that alarm I die a little," Lt. Commander Mel Berg says. Seconds after hearing this alarm he has made it from the wardroom where he has just finished breakfast, across the ship to Control Central. When he walks in, the man on duty says, "Sir, we have a fire in Alpha 107 Mike," and Berg knows immediately that this one will be bad. "Alpha" means only that the fire is in the forward part of the ship; "107" indicates that it is on the starboard side of the hangar deck, beneath the great flight deck. But "Mike" means 'magazine'. Deep in Oriskany's ample belly in Elevator Pumproom No. 1at the sixth level, about as far down as a man can get at that particular point19-year-old Fireman Claude Harper hears the alarm and the call to general quarters that follows it. But since the pumproomservicing the giant hydraulic elevator that lifts planes from the hangar up onto the flight deckis his general quarters station, Harper makes no attempt to leave, not even when thick, acrid smoke begins blowing into the room through the three 14-inch air vents. He moves to close them, but they are jammedtight. In this diagram of Oriskany, the levels below the flight deck are shown and the relative positions of many of the characters in the accompanying article can be seen. (1) is Hangar Bay One, where the fire started at (2), the flare locker. (3) is the aircraft elevator pit. (4) and (5) show the approximate locations of the rooms of Commander Bellinger and Lt. Commander Reynolds. (6) is Damage Control Central. (7) is the pumproom where Harper was trapped and (8) is the "void" in which 15 men escaped suffocation. Harper happens to be a bug on physical culture. He can lie on his back and raise a 170-pound barbell three times on a single breath. But now, for all his well-trained muscles, he cannot get the vents shut. The smoke keeps billowing in on him, each lungful like a breath of acid, and Harper begins coughing like a cosumptive. He grabs fistfuls of rags and stuffs them into the vents, but the powerful draft simply blasts them back into his face. Gray-haired Lt. (j.g.) Bob Williamson, the ship's fire marshal, sprints down the deck. Williamson has been around fighting fires a long time17 years as an enlisted man before he was commissioned last yearand as soon as he gets forward in Hangar Bay 1 he knows what Berg already knows. This one is going to hurt. Somehow a magnesium parachute flare has gone off in the forward flare locker where several hundred other flares are arrranged in racks beside it, ready to go at any minute. Already the firesome 5,400° F hothas burned clear through a steel bulkhead and out where the aircraft are parked. 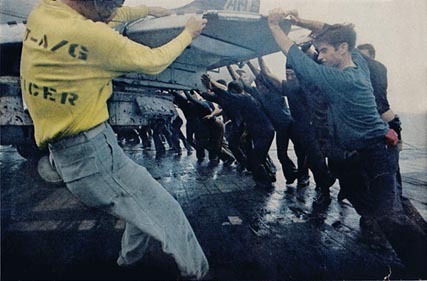 Men on the hangar deck have broken out a pair of hoses and, standing just behind the nozzlemen, Williamson guides them forward into the flame. Water will not put out the burning magnesiumvirtually nothing willbut his only chance now is to use plenty of water to cool things down and try to keep anything else from catching fire. For a few minutes Williamson and his men press ahead. Then a huge fireball explodes from the locker as most of the rest of the flares ignite in a chain reaction. The fireball races down the long hangar bay at ceiling height, over the heads of Williamson and his men. They are knocked flat but, astonishingly, no one is hurt. Unperturbed, Williamson picks himself up and moves forward again with the hoses. As more flares keep exploding, great gouts and balloons of fire burst from the locker and suddenly bits of white-hot magnesium are coming down on Williamson like rain, setting his gray hair afire. Aircraft parked in the bay begin to burn. The fire is barly five minutes old. The internal geography of a great aircraft carrier is incoherenta three-dimensional maze of compartments, hatches, ladders, storerooms, passageways and cul-de-sacs. Even under ordinary circumstances it takes a man a long time to learn his way around, and on this Wednesday morning smoke from the burning magnesium in Alpha 107 Mike, sucked through the ship by the ventilating system, strikes men blind, chokes them, sends them aimlessly stumbling through the labyrinth of the forward section, groping helplessly in the darkness. Some, unable to see where they are, suffocate within feet of hatches that would lead them to safety. Fireballs shoot down the forward passageways. Those men who are caught in them die instantaly, their lungs burned out. Quartermaster Second Class David Willis, 22, finds an ordinary electrical extension cord, tells the 10 young sailors with him in his compartment to grab hold at intervals and then leads them through the twisting passages until they come to a turning they all recognize. There they drop the extension cord and tumble out onto the deck. Willis finds an O.B.A.oxygen breathing apparatusand charges back inside to see if he can help anyone else. He soon gets lost himself as the passages clog with smoke. Then his oxygen gives out. Cool as ice, Willis sits down on the spot, thinks things over carefuly, finally searches out the extension cord where it has been dropped. He knows now where he is and once again make his way out to safety. Skyraider pilots Commander Gordon Smith and Lt. Commander Jim Harmon, who had ecaped to the deck from their quarters, return again and again to the perilous corridors, getting down on their hands and knees to see under the smoke, groping about on bunks until they touch bodies of men who are perhaps dead, perhaps alivethey cannot tell whichand hauling them up to light and air. They stay down until their O.B.A.s give out and then somehow make it back to safety. On deck they take a few gulps of straight oxygen from a bottle. Each time one of them feels about to give out, the other says, "Well, ready to go again?" And off they go, back down into the smoke and fire. Skyraider pilot Commander Gordon Smith got out of his quarters safely and then returned time and again to the ship's burning interior to find other suvivors. Lt. Commander Marvin Reynolds, clad only in skivvies and a T-shirt, choking and half-blinded from the smoke in his personal quarters, somehow finds a wrench that will open his porthole. He starts to work frantically. "Now just take it easy," he tells himself. "If you let this wrench slip and lose it in the smoke, you've bought the farm." Eventually he wrestles the port open and sticks his head out. But no sooner has he taken a couple of breaths than his T-shirt and skivvies catch on fire. So does everything else in the room, including the fishnets and plastic flowers with which he's tried to make the place homey. Reynolds grabs a blanket, soaks it in the washbasin, wraps it around his body and ducks back to the porthole. Five minutes later the blanket is smoldering. For a while there is this crazy thing between Reynolds and the fire. Fire keeps blasting into the room through the louvers in the door, but Reynolds, who has been risking his neck against MiGs and flak every day of his life, is damned if he's going to die this way. He keeps dashing to the washbasin, wetting down sheets and blankets, wrapping himself up in them and sticking his head out the porthole to breathe until he starts catching fire again. Then he sprints back to the washbasin. At last during one of the periods when he has his head out the porthole he looks up and there, on the catwalk above him, is big old Bosun's Mate Noel Hartford. "What are you doing?" Hardford asks. "Well, right now I'm burning up," Reynolds replies. "Hold on," says Hartford and goes off to see what he can find that might be of help. Meanwhile Commander Richard Bellinger, skipper of the carrier's Crusader squadron, is having a problem down in his quarters. Bellinger's recent life has been full of problems, as a matter of fact. A few months ago he was shot down by a MiG and had to be rescued from the water. Then, a few weeks ago, he got into a fight with a MiG-21, faster than his own ship. Bellinger evened his personal score by putting a Sidewinder up the MiG's tailpipe. He like to talk about himself and his men as "the last of the gunfighters." Now the problem is what to do about the fire. He has his porthole open and can breathe a little, but the passageway outside his door is full of flames and his room is soon going to be incinerated, no doubt about that. So Bellinger does the only thing he can do. He takes off all his clothes and starts spueezing his 205 pounds through the porthole. There is a covered walkway outside so there is no danger of his going overboard. But the porthole is small and Bellinger is not. Reaching out, he grabs a heavy cable and pulls and pulls and pulls against it. His chest gets through and his bellyand then he is stuck. He makes one more mighty effort and pops out of the porthole like a cork out of a bottlesafe, and naked as a jaybird. Five minutes after the outbreak of the fire, a knot of men gathers in the choking passages of Officers' country on the second deck just below the exploding flares in Alpha 107 Mike. 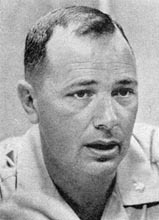 The senior officer is Commander Charles A. Lindberg (Cal) Swanson, the Exec for Gunfighter Bellinger's squadron. Most of the other men are junior officers. They are joined right away by two enlisted men: Bosun's Mates Third Class David Cox and Jerry Robinson. These two are normally in charge of shipboard repairs, but for the last few minutes they have been bursting into officers' rooms and trying to get people out. Cox finds an O.B.A. locker, pulls out the masks and starts to show people how to use them. Meanwhile Robinson turns around and sees an apparition moving toward him through the glooman officer stumbling down the passageway, caroming from one bulkhead to another like some kind of human billiard ball. Blood is running from a deep gash in his head. A moment later he sees Robinson, stops, then turns and careens back down the passageway. The man is obviously in deep shock and Robinson, reacting quickly, runs after him and grabs him by the arm. When he does, the officer's skin simply sloughs off in Robinson's hand, and Robinson realizes that the man is horribly burned. "Sailor, I'm dying," the officer says. A few yards down the passageway Cox climbs up a ladder, opens a hatch leading to the hangar deck and sees a fireball go booming past over his head. When he climbs back down, Cox tells Commander Swanson, "The only place we can go now is down." From the passageway there is a hatch leading down into what the men on the ship call a "void" but which is really a cramped rectangular trunk that drops straight down from the second deck to the seventh. A ladder runs down one side and small platforms jut out at each level of the ship. At each level there is a storeroom used for occassional supplies. For Cal Swanson it is a nasty decision. If the ship is in danger of sinking, trapping himself and his men at the bottom of a blind shaft could be disastrous. But if they stay where they are much longer, men will begin to drop from asphyxiation. Swanson gives the order to go down into the void and seal the hatch behind them. Soon there are 13 of them in there, including the poor burned devil whom they somehow lowered down, all corked up tight in their well. The men distribute themselves on the platforms at different levels in order to equalize the demands on air. Somewhere Cox and Robinson have found a heavy wrench and now they are working their way systematically down the void, knocking off the padlocks on the storerooms and opening the doors to make the extra air inside the storerooms available. But the brass locks are solid and I takes almost 10 minutes of steady hammering to break each one, so it requires about an hour to reach the seventhand bottomlevel. There Robinson finds an old telephone set. It is badly corroded, but he plugs it in, pushes the talk button and asks, "Can anyone hear me? Can anyone hear me? Methodically Robinson starts to take the phone apart and clean it. Just as he gets the pieces all spread out in front of him, the light bulbs in the void go out. It is a minute or so after 8:30. In No. 1 Pumproom young Claude Harper is getting nervous. For an hour and 10 minutes he has kept from suffocating by soaking rags in water and covering his face with them, but the smoke at his station is getting worse and worse. He picks up a phone and, coughing and shouting over the static, finally gets hold of his superior, Machinist's Mate First Class J.B. Tupper. "Get me an O.B.A. down here," Harper says, and Tupper promises to try. Harper lies down flat with a wet rag over his face. A minute later his lights go out, too. Up on the hangar deck Williamson faces a scene out of Dante's Inferno. Two helicopters and four fueled, combat-ready Skyhawks are on fire. Williamson has forgotten his burned scalp and is everywhere at once, getting his hoses where they will do the most good. MiG-killer Bellinger, having found a fireman's suit to cover his nakedness, is organizing O.B.A.s and fire-fighting equipment. On another part of the deck Lt. (j.g.) Bob Davis is on hand, too. Davis is well-known on Oriskany as a great believer in life insurance. He has $60,000 worth of it, which is a lot on a junior officer's salary. Right now he is thankful for every penny. Davis is a qualified Navy diver but on Oriskany his job is ordnance disposal. At the moment he is standing in the middle of enough explosives to blow Oriskany clear out of the water, all of it ready to go at any minute. A tanker plane loaded with aviation fuel is parked near the fire. Fifty-five-gallon drums of flammable paint are down in the elevator pits, 500 gallons of liquid oxygen are in the fire area, and bombs are everywhere. Crewmen swarm over the deck shoving planes on elevators to get them up out of the hangar. Two men pick up a 500-pound bomb between them, stagger to the side, toss it over and go back for another. A man stands calmly playing a hose on a 1,000-pounder so hot it turns the water into steam. Next to a flaming chopper one pint-sized young sailer wrestles a 2-1/2-inch fire hose so heavily charged with pressure that it lifts him right up off the deck. Lt. 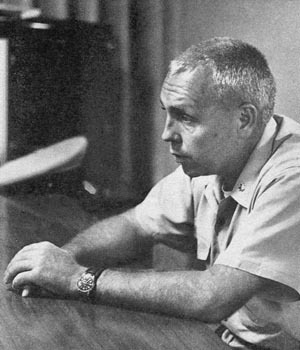 Commander Marvin Reynolds stuck his head out a porthole to breathethe room behind him and everything in it caught fire. Boats Hartford, meanwhile, has found what he was looking for. He has a fire hose and is out on the catwalk again, trying to swing it down into the outstreached hand of poor Marv Reynolds, who is still breathing out of his porthole while the room behind him keeps catching on fire. The hose whips back and forth, back and forth, until Reynolds finally snags it and pulls it inside his porthole with him. From then until it is all over, Reynolds and that fire in his room are on something like even terms. Down in the void Cal Swanson is trying to stanch the flow of blood from the badly burned officer's head with the handkerchief he'd been using to breathe through. His original group has been increased by some other survivors, one of whom while descending slips off the ladder, jack-knives, and winds up wedged unconscious between the ladder and the bulkhead. Now there are two injured men down there. The burned officer is intermittenly conscious. "Don't anybody touch me," he moans, and then, "Don't worry, Cal, I believe God is watching." At about 9 o'clock down in Pumproom No. 1 Claud Harper, choking and coughing worse than before, gets Tupper on the telephone. "I don't know what you guys are doing," he shouts, "but if you'll just get me an O.B.A. down here I'll be all right." Harper adds a few adjectives that he wouldn't normally use. Once again Tupper says that he's trying. It makes no sense to Claude Harper, no sense at all. Why haven't they got him out of there? He gets to his feet, wet rags across his face, makes his way by the light of his cigaret lighter to a ladder and climbs up to the hatch, which has been shut and dogged down as part of the general quarters drill. The hatch seems to be leaking water. Now Harper starts to undo the scuttle, the smaller opening in the middle of the hatch; and when he forces it open, water cascades through, almost knocking him from the ladder. A solid waterfall keeps coming down on him through the scuttle, but if there's anybody around by now who has learned about breath control, it is Claude Harper. The young sailer simply starts climbing straight up into the torrent. He forces his head up through the scuttle, then his shoulders and chest. He thrusts his arm up above his head. All he can feel up there is more water, as high as he can reach. Carefuly he backs down the waterfall and closes the scuttle. Now Calaude Harper knows what Tupper had not had the heart to tell him: tons of water from the fire hoses five decks above have drained down and sealed him in. In the hot, smoky dark at the very bottom of the void Robinson and Cox are lying quietly, waiting, thinking, talking only a little. Robinson thinks about Murphy, North Carolina, his little home town back in the Smoky Mountains where he used to go out early on crisp October mornings with his .22 and pick the graytails and the fox squirrels neatly out of the high branches of the oaks, and where, on the last 4th of July before he joined the Navy, he rode with a great train of 500 mounted men and 96 covered wagons over the pass from Tellico Plains, Tennessee into North Carolina and they camped in the woods near Murphy and stayed up all night making music and square dancing. "I think we're going to die down here," Cox says in the darkenss. "I'm going to fight it out till the last minute," Robinson says. "Anyway," Cox says after a while, "I'm glad the two of us are together." Throughout the morning bits of information from all over the ship pour in to Damage Control Central. In the cramped room 24 men work in an eerie, disciplined silence, for Mel Berg insists on quiet. The room is as yet unaffected by smoke. At a long table young phone talkers take calls on special telephones, scribble symbols on small chits, wordlessly hand them to the plotters who mark the data on their charts of the ship. The plotters then hand the chits toBerg himself. 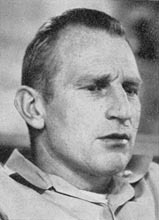 Berg reads and passes the papers to the status-board keeper, who, standing behind a big sheet of Plexiglas, posts the data in mirror writing. The fire has been expanding, cropping up here and there all over ther forward part of the ship, and Berg is chafing. He'd like to be up there fighting it instead of buried away down here merely keeping track of things, moving men and equipment from place to place. After a while water begins seeping into the room through the escape scuttle above. The young phone talkers look at it apprehensively as it runs down the bulkhead. They are a long way down in the ship. Then reports come in that a man is overboard. Are people abandoning ship? "What the hell's going up there?" one of the talkers bursts out. Berg wheels on him: "Hey, hey, settle down, fellows!" The void has become oppressively close and Commander Swanson has the tingly feeling he knows comes from lack of oxygen. He's got to get his men out of here. Young Cox opens the hatch and goes out with an O.B.A. He does not get far, but when he comes back he's got two men from a rescue party. The first problem is going to be getting the woulded officera big manup the ladder and out the hatch. "You've got to help," Swanson tells the burned man. "O.K., Cal, I'll do it," he says but he gets only one foot on the ladder and passes out. Swanson and the rescue men go about the grim almost impossible business of lifting the man, clutching him by the colthes when his skin keeps coming off. Once through the hatch they lash him into a basket litter. A short way along the passageway they hit a sharp turn, and it takes them a few minutes to negotiate it with the litter. Then Swanson goes back down the void and tells the other men to follow. He grabs the lieutenant who's knocked himself out by falling from the ladder. "I don't think I can make it," the man gasps. "Goddammit, you've got to make it!" Swanson roars at him. Grabbing the lieutenant with one big arm, Swanson leads him through the hatch, shouting at the others to follow, Choking, Swanson and the lieutenatn stumble throught the smoke and dark until, finally, there is dim gray light ahead, and a moment later they stagger out into the light, into the airclean, honest-to-God air. Elated, Swanson turns aroundto realize that there is nobody behind himnobody. The men who were supposed to be following are still back in the void somewhere. So Swanson grabs two stretcher-bearers and an O.B.A. and starts back in again. He finds the men still in the void where they have retreated after losing track of Swanson. One of them has passed out. Swanson can see that they'll all start dropping soon. He organizes them quickly but somehow the two stretcher-bearers he has brought back leave the void first, carrying the unconscious man, and when Swanson starts off with his human chain, he finds that the litter is jammed up again at the same bad corner. The smoke is even worse now, and a lieutenant right behind Swanson starts getting faint. Holding the lieutenant up and helping the stretcher-bearers at the same time. Swanson finally negotiates the corner and makes it out onto the deck for the second time. And once again he looks around and finds that, except for the lieutenants he's been helping, there is no one behind him. Commander Charles A. Lindbergh Swanson, fighter squadron Exec, led a chain of men to safety. For the third time Swanson goes back. This time he gets his human chain moving in the passageway. At the sharp corner he runs smack into two rescue men carrying a dead body. "Get out of the way!" Swanson yells through his mask. "I've got people here who can walk!" 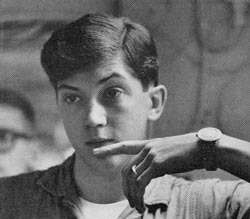 At 10 a.m. Swanson once again stumbles out into the light, looks around, and therethank Godthere they are behind him, young Robinson bringing up the rear with the flashlight. The telephone rings in the pumproom. The sound reaches Claude Harper's fogged brain. He fumbles for the instrument, finally gets to his ear. "Take it easy, take it easy," Tupper says. "They're on their way." Harper says nothing. He cannot speak now. He tries to put the phone back on its cradle but it's no use. He doesn't have the strenght to reach it. He slumps down again, lies there in the darkness and tries to keep his mind busy. "Everything's going to be all right," he tells himself again and again. But everything is not all right. He has been in there with the smoke for hours. And after a while Harper does not think anymore. At 10:30 a.m. Fire Marshal Bob Williamson passes the word to this phone talker, who passes it over the telephone to the talker in Damage Control Central, who writes it down on a chit of paper and passes it to the plotter, who hands it to Mel Berg: The fire is under control. Half an hour later, Bomb Disposal Man Bob Davis runs into Lt (j.g.) Jim Nunn and Machinist's Mate Tupper. Tupper has frantically been trying to get help for his man Harper who has been trapped for hours down in No. 1 Pumproom beneath God knows how many flooded compartments. Tupper has rustled up some scuba gear, and new he, Davis, Nunn and another sailor start down. Still three decks above Harper, they find five feet of water and face a difficult decision. If they let all the water drain down, they might drown the man they are trying to save. But there is no real choice. If they do not try, Harper will certainly die of suffociation. He may already be dead. Carefuly, Nunn, Tupper and Davis work their way down through the third and fourth levels to the fifth. On the fifth level, in the vertical trunk above the hatch that leads to Harper, there is 10 or 12 feet of water. Now it's Davis' turn. In his scuba gear the well-insured Davis climbs slowly down the ladder into the dark water. He can see nothing. His battle lantern is worthless. Bottom. Davis feels around carefully, finds the hatch in the murk. With his knife he bangs on it several times, waits for an answer from the pumproom. Nothing. He starts cracking the dogs that fasten the hatch and suddenly air bubbles stream from the edges. Davis dogs the hatch down again quickly, climbs back up the ladder. "There's air inside," he tells Tupper. What he wants to know is whether the pumproom is big enough to accept all the water in the vertical trunk above it without drowning the man. Tupper assures him that it itunless the pumproom is almost filled with water nowso Davis kicks back down into the dark again and starts undoing the hatch. Fireman Claude Harper, who nearly suffocated at his post, was semiconsious when help arrived. In a few moments, down in No. 1 Pumproom, something penetrates the fog of Harper's mind, something at last. A voice saying "He's alive, he's alive!" and then a hand. Article Copyright © 1966 TIME, Inc. All Rights Reserved. Article used by permission. Webpage Copyright ©2001 Oriskany Museum, Oriskany NY. The following e-mail's from shipmates of the '66 cruise have been received since this web page was published. <!- --- Chibbaro Letter ----- --> "It seems that even after 35 years the memories of that fateful day are more vivid than ever before. I'd had a 'mid' watch that morning. I can still hear Ron Tardio's words . . 'Tony, it's bad; you have to get up'. Ron slept in the bunk below me in the 01 junior officers' bunk room. He was killed despite getting up and dressed before me; he ran aft into the fire. "ALL who died are still remembered. "Thanks for the info. I was there." "I was there that day 10,26,66. I was just a plane pusher on the hanger deck then. As long as I live, I will never forget that day. In fact, I was running #1 elevator about 30 minutes before the fire started. I went to go eat breakfast when all hell broke loose. "I remember the pilot in his skivvies on the flight deck. We all did our best to help all of them. "I am 55 now, and still think about it EVERYDAY. That day took a part of my heart. They have been gone for a long while. "I know a lot of Men went through a lot worse than I did. May GOD be with them and ALL of them have eternal life. I miss them. "May they be in heaven, AMEN."